CLC President Hassan Yussuff spoke to delegates at the OFL #PowerON Convention 2017. 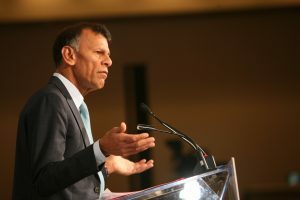 On Tuesday morning, Canadian Labour Congress (CLC) President, Hassan Yussuff spoke to delegates at the OFL Convention in Toronto. Yussuff thanked President Chris Buckley, and the entire OFL executive, for their leadership on important issues over the past two years like Bill 148, a $15 minimum wage for all workers in Ontario and paid leave for survivors of domestic violence. Delegates gave a standing ovation when Yussuff spoke about the CLC’s call for a universal pharmacare plan for Canada. Buckley urged delegates to support this campaign. “This isn’t just about unionized workers, this is about everyone. Join with the CLC in their call for pharmacare and let’s get the job done!” said Buckley. Yussuff reflected upon past victories like the expansion of the CPP and last year’s comprehensive ban on asbestos.